Update: Hmm, which came first: this… or the suspiciously similar My First Quantum Translocator? I’m inclined to think the latter, in which case Momentum’s a bit of a slyly sudden ‘tribute’. You like platformers with a twist. You like chubby robots with spindly little arms that wobble about a bit when they jump. You will therefore like Momentum, a short little diversion from the man behind double-cat beaut Black And White. 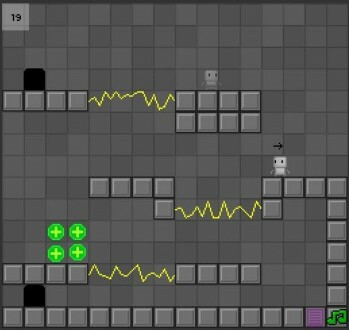 The twist in this platformer is that your robot can ‘store’ momentum to ‘retrieve’ later. So, first, you do a jump and press X to store the upward movement. Then, later, you can reach a high platform by using that previous momentum to boost a normal jump. Yes, it’s quite tricky to explain. And, yes, if you stuck a mighty great glowing gun in the hands of the main character, you wouldn’t be far off a 2D version of Portal. Assuming he could hold the gun with his spindly robot arms, the little cutie.